This sourdough soda bread takes the ease and tastiness of my sourdough English muffins — and makes it even easier! Truly! I worked for about 10 minutes to get a delicious and beautifully-risen loaf of bread. No it's-just-too-sour or it's-kind-of-like-a-brick-but-we'll-still-eat-it. No yeast. And no preservatives! Plus, this recipe is so versatile. How do mouth-watering Asiago herb dinner rolls sound to you? Or, what about cinnamon swirl sourdough bread? The sky's the limit! Enjoy slice after slice of nourishing, whole grain, sourdough goodness — fresh from your very own oven. Enjoy slice after slice of nourishing, whole grain, sourdough goodness — fresh from your very own oven. 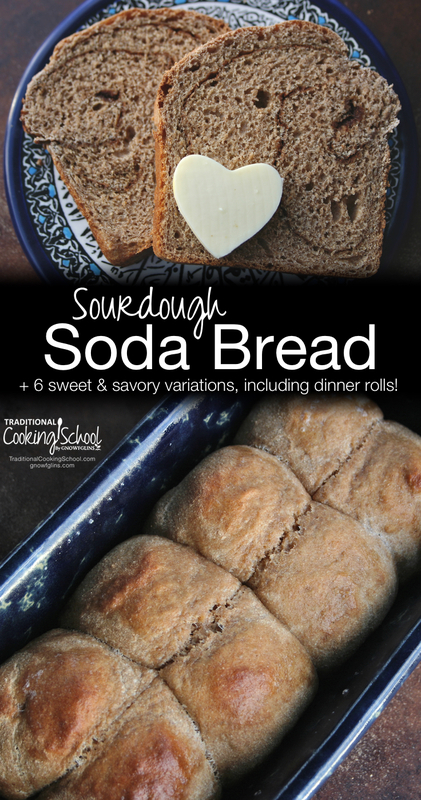 Have fun making this sourdough soda bread your own! Be sure to check out the variations in the Recipe Notes. Whisk together sourdough starter and milk in a large bowl. Stir in flour until combined. Let sit for a couple minutes to let flour absorb liquid. Continue to add flour by the 1/8 cup, if needed, until dough can be molded into a ball that holds together nicely and sticks only slightly to your hands. Add 1 tablespoon of flour at a time if the dough is too sticky -- but a little sticky is good. Put dough ball back in the bowl. Roll in a tablespoon or so of olive oil. Cover bowl with a tea towel and plate. Set aside for 8 hours or overnight -- less time if you have a very warm kitchen. 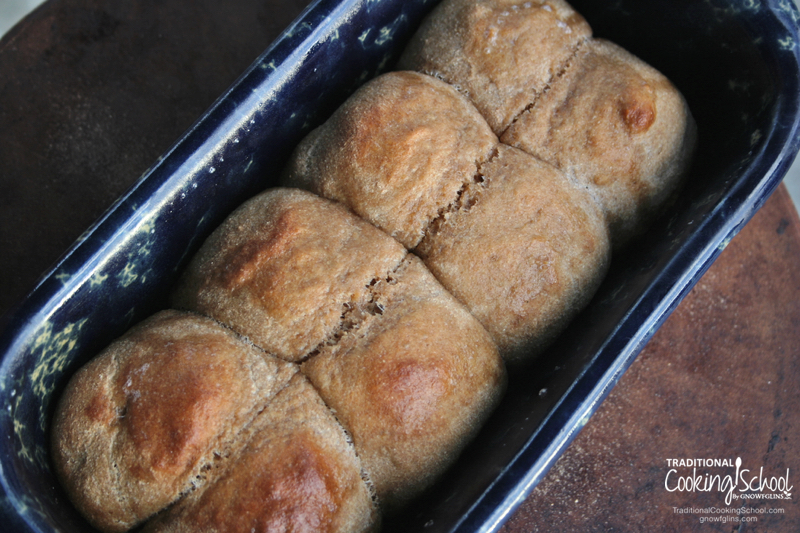 Grease loaf pan and dust with a bit of cornmeal or flour if necessary. Sprinkle baking soda and sea salt on dough. Knead for 3 to 5 minutes, and until dry ingredients are evenly incorporated into dough. Shape dough into a loaf and place it in bread pan. I like to shape my dough into a flat-ish rectangle, fold it into thirds, and rolls it up, tucking in the edges of the dough as I go. Slice dough across the top to allow for expansion. Place loaf into a cold oven. Set to 375 degrees Fahrenheit, and bake for about 70 minutes. Check at 40 minutes, and perhaps cover with a piece of parchment paper at that time to prevent over-browning. Once baked, remove from oven and rub with a bit of butter over the top. Let bread rest for a few minutes, then transfer to a cooling rack. Store in a sealed contained on the counter, or pop in the freezer for future enjoyment. Enjoy as sandwiches, or as slices with a generous slather of butter and jam! This recipe is so versatile, how do mouth-watering Asiago herb dinner rolls sound to you? Or, what about cinnamon swirl sourdough bread? The sky's the limit! Try one of these variations or experiment with your favorite flours, such as spelt or cornmeal. Add in your favorite nuts and seeds right before the souring stage, or add your favorite herbs, spices, dried fruit, and cheeses in during the time of kneading. Replace 1 cup of flour with 1 cup rye flour, and add about 4 tablespoons caraway seeds to your flour mixture as well. Replace 1 cup of flour with 1 cup buckwheat flour. At the time of kneading, add 4 teaspoons cinnamon and 1 cup raisins. Flatten dough into a rectangle. Sprinkle with 1/2 cup sucanat and an addition 2 tablespoons of cinnamon. Roll into a loaf shape and place in the loaf pan. I do not slit this loaf along the top. After dough has soured, knead in 2 cups grated hard cheese, 2 teaspoons dried basil, and 1/2 teaspoon dried oregano. Roll dough into (24) 1-1/2 inch size balls. Grease baking dish and tuck dough balls next to each other. Bake as directed above for 20 to 25 minutes. Check after 15 minutes and cover with parchment paper if necessary to prevent over-browning. After dough has soured, knead in several teaspoons dried rosemary. Brush top with butter and sprinkle with sea salt before baking. This recipe also works wonderfully when halved and baked in a mini loaf pan. Mini loaves are perfect for my boys' small hands! Simply halve above ingredients, follow instructions, place in a mini loaf pan, and bake for about 45 minutes. Don't forget to place in a cold oven and cover with parchment paper for the last 10 minutes or so. Will you try this sourdough soda bread? What variation sounds yummy to you? This post was featured in 90 Nourishing Egg-Free Breakfasts, 26 Sourdough Bread Recipes, and 47 Trim Healthy Mama E Meals & Snacks With Traditional Foods. Great timing Erin!! Just this week I’ve resurrected my faithful sourdough starter (from freeze-dried state) and have been making bread and your sourdough English muffins. My boys were asking for a cinnamon loaf, and I hadn’t had much success previously…so was hesitating. Perfect timing! Thank you so much! I also have an interest in switching from spelt flour to Einkorn for these sourdough recipes. 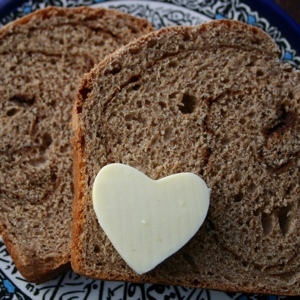 Have you tried Einkorn in this recipe yet? What modifications would you suggest? hi erin, i haven’t made this recipe with einkorn but i just used it along with kamet for wardees biscuit recipe in fermenting book. i added sharp cheddar and cooked sausage. they are amazing. i ate 2 right out of the oven. they are lighter and fluffier than any other i’ve made. i don’t think i did anything different. i’m gonna make them again soon and hope they turn out the same. will b trying this recipe with same flour combo prolly tomorrow. thank you so much for all your recipes. your sourdough recipes were the first i had success with. thank you. from there i have learned how to play with sourdough and have gotten fairly comfortable working with it and converting some of my favorite recipes to sourdough. i bookmark and copy and save all your recipes. do not want to lose them! Thanks so much for your comment Jenny! You brought me such a smile. So glad you are enjoying the sourdough recipes… I continue to enjoy them too. Makes the sharing all the more fun! 🙂 And yeah for making the recipes your own and tweaking some of your favorites into something more nourishing. I love that! So, no honey right? Just making sure, I make your English muffins all the time and love them!! This is great! After making your English muffin recipe several times in many variations (white, whole wheat, rye, ww/raisin/pecan, rye caraway) with great success (family & friends have been SO impressed, ha!) I made a raisin bread loaf with it – I think I’ve used all organic white flour for it both times, but I might have used spelt. I find it makes a great light loaf, too. I just added 1-1.5 cups golden raisins to the dough before souring, and added 4T coconut palm sugar with the salt & baking soda. This is now Husband’s favorite! I love that this is basically a ratio recipe – so easy to remember. Thanks!! Erin, this looks wonderful. Can’t wait to try it! Am I correct in seeing that you don’t let the dough rise when you put it in the pan but put it straight into a cold oven? Does the starter need to be at its domed state? Thanks! HA! Then this is the best bread recipe ever! 🙂 Thank you! Perfect timing!! I’ve been using and sharing your English muffin recipe with family and friends for a couple of years. I started out making them in a cast iron skillet, but now I bake them on cookie sheets. I always double the recipe which makes it the same amount as your loaf recipe. Last night, I had a couple of friends over. While we were chatting, I accidentally measured out twice the starter and then fed my other starter (never measure and chat at the same time!) I’m not one to waste starter, so I decided to make a lot of muffins today. I divided it in half into two bowls for. I’ve always liked English muffin bread, so when I got up this morning, I decided to see how similar a bread recipe was to the muffins. I was so happy when I came across your recipe! I now have two small loaves in the oven now and my usual 16 muffins rising on two cookie sheets. I can’t wait to try the bread! Diane, I’m intrigued by your method of cooking the English muffins – in the oven! Please tell me how they differ from stovetop, how long, what temp? I always feel like mine are a little goey still in the middle, but don’t really want to take the extra time to dirty another thing to put them in the oven. Hoping you can help. I’ve made this twice now. The taste is wonderful! The rise is beautiful. The crust all the way around is very hard. Is this normal? 1. After adding the 4 cups (or 2 cups) of flour, give it a good stir and let it sit for a few minutes. Stir again and add flour as necessary to achieve a somewhat sticky dough. The wait time will prevent you from adding too much flour. 2. Cover your loaf with parchment paper earlier in the bake time. 3. You could experiment with different flours. Say… 1/2 spelt 1/2 100% whole wheat or maybe 1/2 whole wheat pastry flour 1/2 100% whole wheat. 4. You could also try decreasing your baking time. Everyone’s dough consistency will be a little different as will their ovens, so feel free to experiment there a little bit. 5. Adding a little ground flax seed may help soften things up. Keep me posted Robin. So glad you are giving it a try and enjoying the taste and rise. Hoping I can get some tips to perfect the appearance of the loaves…everything is great except the loaves are splitting around the top, just at the top of the loaf pan. I’ve done the plain one twice and the cinnamon twice. All 4 have done this. The rolls did not. Also, I’ve having trouble with the cinnamon loaves. What size are you rolling the dough out to? Since I like the swirly inside stuff to be spread out, I’m rolling out pretty big. Only trouble is when I’m rolling it up, it is way too long for my bread pan. So then I tuck the ends in quite a bit and wind up having to reshape the whole loaf. Doesn’t make for a pretty swirl when it’s cut. I’m trying to follow your guide for shaping. Can you go over that again, and put the dimensions of your rectangle? Thanks! BTW – my family tells me these taste great! I’m still GF for the moment, ugh!!! But I’m working on that! One more question – when the dough is soaking, are we looking for it to rise before we shape and bake? I’ve been doing that, but sometimes when it doesn’t rise, I’m not sure whether I can use it in that state or not? Hi there Sherri~ Thanks for your comments. *The rise: No, you do not necessarily need to see a rise. If your dough has soured for the appropriate amount of time, go ahead and carry on with the recipe. *The splitting: Are you slitting the plain loaf down the middle? Where is your loaf splitting that it is not preferable to you? *The cinnamon loaves: I’d try rolling it out the width of your loaf pan and then however long you’d like. If you roll it too thin, the dough does have a tendency to break. Does that help? Do you have a mini loaf pan? You could experiment with what works best for you and not use quite so much dough. Yes, I am splitting the plain loaf down the middle. It is splitting AROUND the loaf, from a side view it is horizontal with the top of the bread pan. This is happening toward the end of the baking time. Only one time did it not split, and I believe that loaf still had some goeyness right in the middle, so I would say it didn’t cook long enough. The same thing is happening with the cinnamon, with the same result as plain loaf on not splitting/shorter cooking time. Also, the one time it didn’t split this way, I treated the bread dough differently. When I was initially mixing in the flour with the liquid ingredient, I gave the dough a rest after adding 4-5 cups of flour. So I am assuming the dough absorbed some of the flour and the end result was less flour than usual. Now, I’m seeing your comment that you knead the dough 3-5 min. when you are mixing in the flour, as well as at the end. Do you take the dough out of the pan when you do this kneading? At what point do you take it out of the pan? This may be the key to my splitting issue! The tip about how to roll out the dough for cinnamon bread is working perfectly! Get a great swirl and it fits nicely in the pan. BTW – does anyone else make 2 loaves at one time like I do? I have always made one plain and one cinnamon, and I’ve always prepared the plain one first since I usually end up with cinnamon and sugar on my kneading board. However, this does make the plain one wait a bit before it gets in the oven. Thanks Erin, and everyone else! This is such a great recipe! Hi Sherri~ Thanks for your comment. I love that you are still working on making it just right for you. *You know, as far as the loaves splitting… when you look at the rye loaf above, is that what you are talking about? The gluten hasn’t developed like a regular loaf of bread, so it might be prone to splitting a bit. *I have doubled my recipe before, and I don’t feel like having one sit a bit makes any difference. *I think adding a bit of flour and then allowing a rest before you add more (if needed) is a good thing. It will prevent you from adding too much flour. *As far as the kneading goes… I think it depends on how I feel it’s all coming together. I just had to reread my directions. 🙂 I know there are times when I just stir and fold it on itself several times and other times when I work it a bit. I’d say give the kneading a try and see if it makes a difference for you! *Glad you are getting a pretty swirl. So tasty! Ok – got some answers and more questions for you! You are so sweet to continue to work with me! ~The loaf splitting issue – yes, your pic on top is what is looks like, except mine is much more so…sometimes it looks like the top half will just come off, other times it takes a lopsided view. Either way is undesirable as the pieces come off when slicing. My son looked at it the other day and said, “Mom, why don’t you try putting 2 cuts instead of 1 on the top?” I must say it looks like it does need to expand more, so maybe giving it permission might be easier? ~I tried kneading the dough when I first mixed it up for 5 min., then again after I added the soda at the end. There wasn’t much difference in the splitting issue. ~After looking at your directions again, I only see one knead time, but in the directions given to someone above in the comments section, you mention two. I would think 2 knead times might improve develop the gluten more, but then again I don’t want to overwork the dough. Can you give some more direction as to 1 or 2 kneads? ~One more NEW question: Would this be suitable to mix up in my Bosch bowl with the bread dough hook? I’m thinking of the initial mix time only. I’m needing to find an easier way on my hands/fingers. Hi Erin! I’ve so enjoyed all your recipes and am so very grateful for you. I noticed that the sourdough English muffin bread recipe doesn’t really call for much kneading. Do you use a mixer or just mix in the flour by hand? After you’ve incorporated all the flour, do you knead at all before adding the baking soda and salt or just knead 3-5 minutes after they’ve been added? I haven’t tried your English muffins, but hope to soon. I tried the bread, which is lovely, but my loaf was a bit crumbly. I’m trying so hard to find a good sandwich bread which isn’t quite so sour and crumbly and doesn’t use yeast. Thanks again! Blessings to you! Hi Michelle~ Thank you so much for your sweet comment. I’m glad you’ve enjoyed my recipes! Here are a few things you can try the next time you make the bread. 1. I knead the bread 3-5 minutes or so initially. The longer time for a large loaf. I knead the bread for another 3-5 minutes (maybe a bit more for the larger loaf) once I’ve added in the salt and soda. 2. The crumbliness might have been caused by a too-dry dough. Next time, maybe reduce your flour amount. 3. Adding ground flax to the souring dough might make a difference. Flax does help hold things together. You could try that. 4. Over-baking could also dry out the loaf. And I also encourage you to give the english muffins a try. My husband uses them untoasted for his daily lunches. He always saves them for last because to him they are like a dessert! (And I make him peanut butter and jelly 🙂 ! )Feel free to omit the honey and the wait time once the salt and soda have been incorporated. Usually, I just scoop an amount of dough and shape it right on my already warmed griddle. (I MUST find a moment to edit that post!) Find what works best for you, and let me know if you have any other questions! I’m posting this question separately, again since I had a long post with it initially. I’m wanting to make alot of this bread, so am needing an easier way to mix up the dough. Can I use my Bosch mixer for this? *Yes! I would definitely give the mixer a try. Mix the starter and milk together first. Add the flour. Mix. Allow it to sit a few minutes. Add enough flour, a small amount at a time, and mix until you achieve a somewhat sticky dough. Let it sit covered for 8 or so hours. Sprinkle on the salt and baking soda. Mix again until the new ingredients have been fully incorporated. 3-5 minutes maybe? I’m not very familiar with these mixers. And also, I do not feel it is necessary to double the baking soda (or triple the amount) as the case may be… I haven’t done much experimenting with larger batches, but 2-3 teaspoons will probably work just fine for a double batch. For a triple batch, I think I’d try 3 teaspoons… maybe a bit rounded? *Something else you could try to deal with the breaking and lopsidedness: After kneading, put a little olive oil on your hands and shape the dough into a rectangle. Roll it up as tightly as your are able. You could also try making a tight round loaf (are you familiar with how to do that?) and then form it into a oval before placing it in the loaf pan. Place it in the prepared pan seam side down. Try slitting it with three diagonals across the loaf. *I’ve edited the directions to include 2 knead times because I will make the bread that way as well. Funny though, the night that I made the edit I prepared the dough for a loaf and I only stirred together the initial dough… I wanted to get to bed! Both methods work. I will add that to the post today. Success! Yea! I’ve done 4 loaves in the mixer, with consistent results. For anyone else whose arms, shoulders and hands aren’t quite what they used to be, here is how I made this recipe a snap to mix together. I have a Bosch mixer and used the dough hook, so adjust accordingly if yours is different. ~Pour in the liquids, blend until just mixed. If you are doing raisin cinnamon, this is where I add the raisins and cinnamon (this mixes up much better here than adding it after soaking). ~Add 1-2 cups of flour at a time, blending until most of flour is wet. (I’ve tried mixing after each cup of flour, and also with 2 cups of flour at a time. No difference.) Don’t worry about the little bit of flour in the middle – it will get caught when dough starts coming together. ~At 5 cups of flour, reduce to adding 1/2 cup of flour at a time. Mix until the dough cleans the sides of the bowl. ~Oil your hand and take dough out of mixer bowl and transfer to soaking bowl (dough will be sticky). ~Add a little more flour until it isn’t sticky (for me it was just about 1/2 cup more). ~Oil the dough and let it sit. Each batch only takes about 5 minutes to mix together now, and no aching shoulders! I only mix up one batch at a time in my Bosch. I don’t think there is enough room to double it, plus then you’d have to divide it out. I tried kneading a loaf twice (once before rising agents and once afterwards), and another one just once. No difference in final products – I can’t tell which one was which. I don’t know exactly why, but this has also solved my splitting problem! My loaves are coming out beautiful! Erin, thank you SO MUCH for helping me perfect this! My goal is to sell these to friends for some extra money. That’s why I needed an easier, faster way, plus consistent final product. THANK YOU Erin!! I’m all for helping others have success in the kitchen! We all need to find ways to reduce time in the kitchen, yet produce great food! Thanks for this, Sherri! The last time I made a double batch and decided to try kneading it in my Electrolux. I made a loaf of bread and a pan of cinnamon rolls. The rolls were out of this world. The bread still wasn’t as I would have liked so this time I’m making it into regular rolls. Then today I come back to find this update. So I’m trying all the mixing/kneading in my mixer! I’ve had my Electrolux for years but have used it very little since I’ve converted to sourdough. I would be thrilled if this turns out beautifully and I can have the best of both worlds. 🙂 I’ll post here how it turns out. Just wanted to make sure you understood, I do not knead it in my mixer, just the initial mixing up. Let us all know how that works for you. I need to also add that I’m using a rye starter and spelt flour in my breads. For the spelt flour, I do find that I’m using between 6-7 cups of flour. This makes my loaves very large, which is fine for me! Plain loaf is about 3 lbs and cinnamon is 3.5 lbs. OK, this is my update. I did all the mixing/kneading in my Electrolux Assistant. I put the starter and milk in the mixer, mixed, then added flour (about 2/3 spelt and 1/3 wheat) a bit at a time until it made a doughnut shape around the middle and let the machine run a couple of minutes. I find I use much less flour than if mixing by hand. I let it sour in the bowl. Then I added the salt and baking soda and let the machine run a few more minutes. I doubled the recipe which my machine easily handles. I took the dough out , cut it in half. I rolled out one half, slathered a butter/sucanat/cinnamon mixture on it, rolled it up and cut it into cinnamon rolls. The other half I cut into about 6″ pieces, twisted into a knot and made two pans of rolls. It was all FABULOUS! The dough was beautiful to work with. I’ve made these rolls and cinnamon rolls for many years with freshly-milled flours but now with sourdough, I can really feel good about them. Will this recipe work if you let the dough rise and put it into a preheated oven instead of a cold one? I was wondering if the rolls would be even softer that way. RobinP – I’m having trouble getting my butter soft enough to spread without tearing the dough. How do you do this? Has anyone tried plain white flour in this recipe? There are times when I want to gift someone and they would prefer white flour. Absolutely delicious! I have a daughter who is allergic to wheat. My sourdough starter is out of spelt and I made this loaf out of spelt! It was fabulous. Thank you for the recipe! Rhonda…please share how you made your spelt sourdough starter and what quantities you feed it with? I am using a rye starter, but am interested in the spelt one. I only bake with spelt. Thanks! Sherri, you can use your starter and just start adding spelt when you feed your starter. You can use any flour that you want to in a starter. I actually started my starter using a recipe that called for all purpose flour. I substituted the whole grain spelt flour (that I grind myself) in place of the all purpose flour and it worked. I keep my starter very thick and feed 1/4 cup water and 2/3 cup of freshly ground spelt flour. It is working great and is not too sour. This makes me so happy. The bread makes me feel like a sourdough hero instead of a SD failure!!! SO good!!! And…EASY! Thanks so much!! Has anyone done this with a gluten free starter and flour? I have a boosted rice starter now and want to try this…but all my breads are bricks these days so I would love any tips on ratios and how a gluten-free dough should look or feel. Thanks! Has anyone tried doing the loaf recipe in a dutch oven? Thank you!